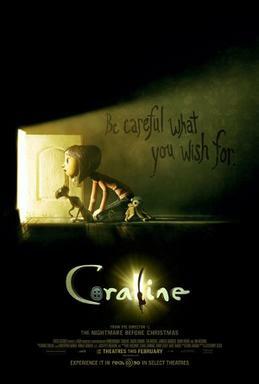 Coraline is a 2009 stop motion adaption of the 2002 Neil Gaiman novel of the same, in the genre of fantasy / horror. It is the tale of Coraline Jones (Dakota Fanning), who finds a secret door and traveling through it finds an improved version of her home, with a loving mother and father and a more quiet neighbour. She slowly decides to embrace this new world, until she realises that everything is not as it seems. I was quite skeptical towards the film, seeing as it’s compared by such wonders as Tim Burton’s The Nightmare Before Christmas, and seeing as its plot is rather… clichéd. Still, I was surprised. The film holds an outstanding quality both in its characters and interesting plot, with many turns and twists and foreshadowings, as well as jokes and beautiful animation. The film is described as fantasy / horror, and it is. Few stop motion / animation films keeps my suspense for as long as Coraline.